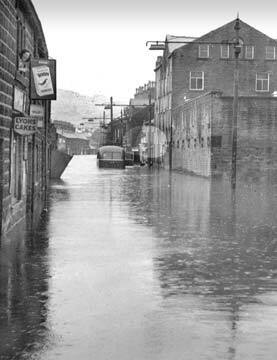 A thoroughly water-logged Mytholmroyd in 1954, when flash floods suddenly struck in August. Passengers in the stranded bus were given shelter in Mount Zion Church. Who, we wonder, was the lady surveying the scene from a first floor window of the shop on the left? BT440 V Stanley Ingle. Floods, often of awesome dimensions, have been a regular occurrence in the Calder Valley since time began. By the 19th century reports of these natural disasters were featuring in the local press. The first newspapers appeared in the upper Valley around 1830, only too happy to give readers a good dollop of gloom, doom and devastation! And what could be better than the heavens unleashed? 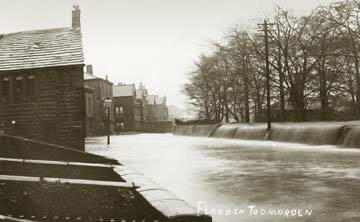 Earliest reports were terse: one dated November 16 1830, simply noted "A great flood at Todmorden." By coincidence, 36 years later on exactly the same date, the town was hit by an even more disastrous deluge, by which time press reports were a little more colourful and informative. A deserted Market Street, Hebden Bridge, in 1946, looking west. It was weeks before the flood-water finally subsided. On December 22 1837 Hebden Bridge suffered "the highest flood recorded" when water levels reached a massive nine feet in places. Reported an observer: "The water was within half an inch of reaching the surgery of Mr John Thomas." (This, presumably, was unusual). "The arches of the canal viaduct at Black Pit were unable to take the waters which consequently rose to the height of the canal and ultimately flowed over it. The twentieth century started with heavy snowfalls and blizzards after which 1901 wilted in sizzling summer temperatures up to 90F. As the heat soared and drought gripped the district, people prayed for rain. They got it, in bucket loads, in November. 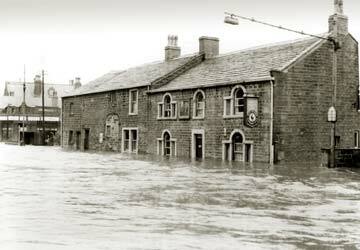 Folk waited a further 19 years for the next really serious floods which arrived with a vengeance on February 10 1920. In the meantime the weather continued to play nasty tricks: the first three weeks in May 1903 were the coldest on record since 1841 and exceptionally heavy snowfalls in January 1919 caused havoc in Todmorden, virtually cutting the town off. A year later the whole of the Calder Valley suffered when the heavens opened so suddenly people were taken completely unawares. Hillside streams turned into raging torrents and low-lying land, from Luddenden Foot to Todmorden, was inundated. 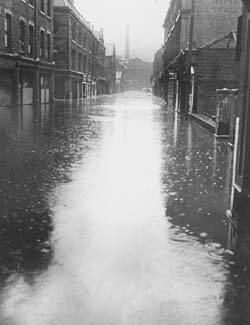 The water subsided as quickly as it had risen and a massive mopping-up operation began: it was noted that the Calder appeared to be subject to serious flooding every 10 years or so. What were generally agreed to be the worst floods in living memory, however, occurred in 1946 when entire districts were cut off after torrential rains struck out of the blue in September. The massive surge of water which then thundered down the valley swamped hundreds of properties, leaving widespread destruction in its wake. Since then floods have struck with depressing regularity, most recently in 2000 when hundreds of homes and businesses were devastated in the sudden June downpour. The flood defences now set in place appear to have tamed the mighty River Calder and its tributaries but, as the climate pundits warn, global warming could well pose the next threat to our verdant valley. When were the worst floods of the 19th century? And which area got the worst of it in the 20th? All is revealed in Issue 15 of "Milltown Memories" - and much more!